The biggest lesson of alpaca ownership is patience. 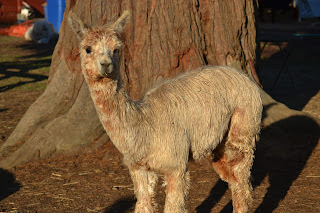 After waiting over almost 12 months for the birth of a cria, then waiting another minimum of 6 months for them to grow and be weaned, we are finally here to start show season. This year is my best crop of babies to date. I'm getting giddy about showing HSH Speirit Light, HSH Lord Calvin, HSH Jujuge, Peruvian Qinti's Charango and Calzada's Manchu's Olivier. 3 Huacaya and 2 suris are going to AlpacaPalooza in Washington this coming weekend. It is going to be a blast. We have been halter training for about a month now. It has been nice being able to go at a slower pace and not my normal wait to the last second cram session. Each weanling has had their own style and behavioral issues to overcome. Jujube would stand nicely but not walk well. She is very spirited and I can tell she will be a handful in the ring even with all our practicing. Speirit walks nicely but doesn't like to be handled but she is doing better at both. Calvin, haltered up easy as can be but did not like to walk but now he is walking and standing like a champ. Charango did two steps and a bunny hop for days of training and now he walks and stands so nicely. He will be the lead hummer of the group going. Olivier is my Jr Herdsire so I'm anxious to get him out in the public for others to see what a handsome Herdsire I have here to stud out. I have been so very fortunate to have the last Caligula baby born after he passed away and that is Speirit's mother. 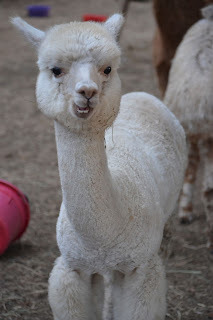 She is as white as can be and has such beautiful fleece. I can't wait to see and hear what the judges have to say about her. She has been such a shy little girl and just starting to come out of her shell. She just learned to take pellets from my hand. It was cute when the vet was here doing the vet check required to attend the show. Speirit is the most shy of all yet she had the slowest pulse. She took it all in stride. Jujube is a character. She has her dad's spirit but has her mom's friendlier nature. Her sire is National Champion Greystone's Kaleidoscope that I co-own with Wings and A Prayer. She is the spitting image of her poppa and I am so hoping she garnishes as many blues and championships as he has won! Jujube loves to come and get her chest scratched and get some treats but halter her up and practice what the judge is going to do and she says "No thank you!" She will test my handling abilities in the ring for sure. But I love her spirit. It adds to her fun spots that make her a beautiful suri appy. I just love her looks and her fiber is some of the nicest suri fiber. I just love to watch her run with her full fleece. Suri fleece just sways and flows with their movement. It is beautiful to watch. If anyone is near WA April 6-7, come see us at our Hum Sweet Hum pen. We are sharing pen space with Wings and A Prayer this year. It is going to be fun. Come and get your hands on the kids and let me know what you think.